Building a collaborative professional learning space for Oregon educators | Clarity Innovations, Inc. The Oregon Department of Education wanted to create a powerful new way to share information and resources, and allow educators to collaborate via interest-based groups. We spearheaded the effort to design and build the Oregon Educator Network. Key to Oregon’s pursuit of its ambitious 40/40/20 goal is a revitalization of the education profession and the establishment of a new statewide network to provide for a comprehensive system of support—creating a culture of leadership, professionalism, continuous improvement, and excellence for teachers and leaders across the pK-20 education system. In 2015 the Oregon Department of Education (ODE) turned to its partner High Desert ESD who asked Clarity to lead efforts in creating this network, based on our extensive expertise in designing and building professional learning communities for education. Our team worked closely with High Desert ESD and ODE to translate their high-level objectives into clear requirements and feature specifications. We then architected and built an extensive Drupal-based web platform to serve as the basis for the network. This work included designing a highly visual, responsive theme, as well crafting custom code to expand basic functionality to meet their requirements. 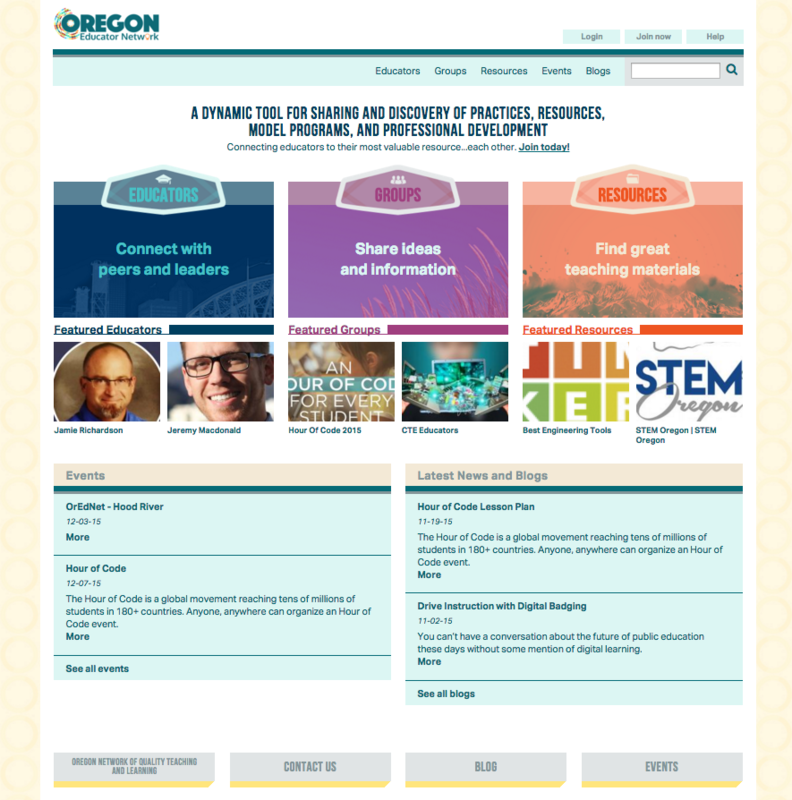 In September 2015, ODE launched the Oregon Educator Network (OEN), a collaborative professional learning space for Oregon educators. This powerful tool provides resources, online events and the opportunity to personalize professional learning by allowing educators to start and join collaborative groups based on professional interests and projects.